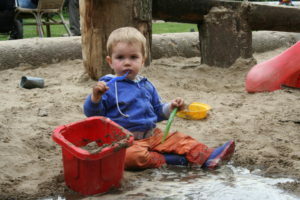 Our adventure playground is situated next to the petting zoo meadow. The pool in the sandbox is a favored place. Children can operate the old-fashioned water pump by themselves which always gives great joy. In addition, there is a bird’s nest swing, a special see-saw and a slide. There are many go-karts in the playground, with which to tour De Roek. We often see that the go-karts are also in with the parents. The adventure playground has a number of picknick tables, which guests are free to use. In summer, the tables have parasols, as the sun let its presence be felt when it shines. At those times the sandbox is also covered with a canvas. Next to the playground there is the recreation area with a ping-pong table and the opportunity for an old-fashioned game of shuffleboard.